With a confirmed line up and a legion of fans which can not stop screaming their name, IN THE RED has only just begun. Hailing from the East Coast and already having the right formula to belt out killer hooks, aggressive guitars, astound drum beats and a stellar bass line: Cody (lead singer) Peter (Guitar, Vox) Art (Bass) and John (Drums, Vox) can safely say they are ready to take on "The New World" with their new song dropping on March 30th, 2018. With a sound displaying the talents of Sevendust, Godsmack and Red Sun Rising, one could establish IN THE RED stands out completely on their own and does not make excuses for being true to their craft. 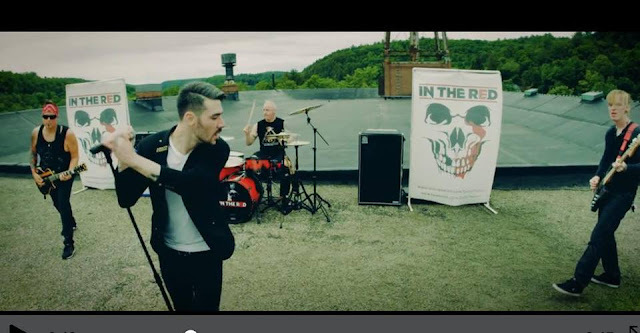 IN THE RED is assertive, powerful and can melt your face with a live performance colliding worlds with fresh rock and metal. IN THE RED is not afraid to say SCREW Society's Standards! Let's just throw the horns!!!! In the past new years, IN THE RED has released songs which makes many listen: "Bad Apple," "The Enemy" and "Good Girl." Plus their album "New Blood" landed on UnRated Magazine's Top 40 of 2017 at #14. A huge accomplishment considering this band is self made and takes on every en-devour. The new video for "New World" will stabilize IN THE RED as a band to watch and to support for years to come!! !